Thank you readers and followers of Letters to Hildegard. In 2014 I have been writing to Biddy Early each week and my blog to her can be found at Letters to Biddy. I took some time this year also to get feedback from readers and have decided to go back to using the blog platform I used in 2013 for my weekly letter to Hildegard of Bingen. 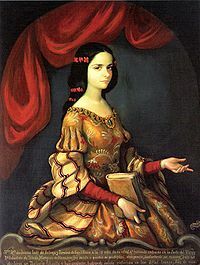 I have spent some time reflecting on who I would like to write to in 2015 and have decided on Sor Juana Ines de la Cruz. Like Hildegard she was a learner, a disrupter, an innovator, musician, writer and more. I first met her in an instagram post from a family member where she was in a multimedia street art piece and my eye was immediately drawn to her. I am looking forward to getting to know her and share my everyday pilgrimage with her. This entry was posted in Uncategorized and tagged 2015, Biddy Early, blog, Hildegard of Bingen, Juana Ines de la Cruz on December 21, 2014 by Moira Were AM.